As much fun as it indubitably is, the Edinburgh Fringe can feel like a drain on many things. Your funds, for a start; a capital city caught in the grip of festival fever is an expensive place. It’ll also try your patience, as anyone who’s attempted to negotiate the tortoise-like pedestrian traffic of the Royal Mile on an August Saturday will attest. Still, the most underappreciated drain applies to an underappreciated area, that already gets more than its fair share of wear and tear. That’s right, YOUR FEET. Unlike London or Paris, Scotland’s capital is not a vast, sprawling metropolis, but the spread of Fringe venues covers the city centre and bleeds out into the outskirts. From Newhaven to Danderhall; Abercorn to Musselburgh, it takes over a fair chunk of this notably hilly city, and if you’re planning on walking anywhere, you can bet your feet will begin to feel the strain. That’s why this year I’m casting those trusty ol’ trainers’n’plimsolls aside and trying out something more durable. Over three days of gigs at Edinburgh’s Summerhall venue – at the opposite end of town to my New Town abode – I’m going to walk to and from each show in a sturdier shoe, testing my heels’ endurance with a day of Fringin’ followed by an evenin’ of standin’ and watchin’ and listenin’. 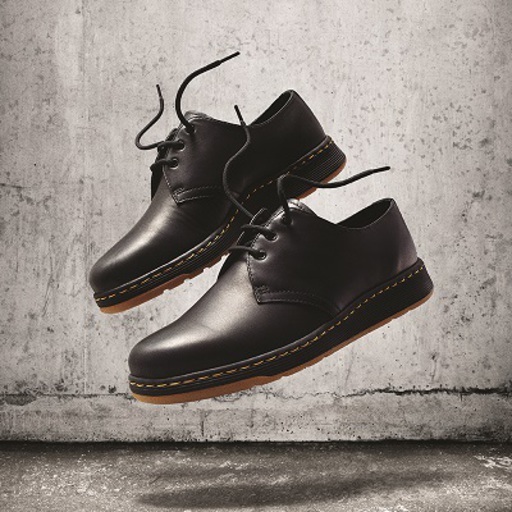 For this task, I will require something durable yet comfortable, so I’m trying out the Cavendish shoe from Dr. Martens’ Lite range; stylish enough to give the illusion of their enduring classic footwear, but without the sometimes painful experience of ‘breaking them in’. See, I’ve thought about this. After a long day’s wandering, I arrive at Summerhall for the first of the shows and realise there’s something missing, chiefly the dull ache of a long day’s schlep around the city centre. Still, as you’ll know if you’ve ever stood on the hard floor of a concert hall for several hours, there’s still plenty of time for that to kick in as the evening progresses. As it turns out, I’m ready for many things this evening: the swooping sturm und drang of Edinburgh sextet Broken Records' more grandiose moments; the love in the room as a group of local favourites deliver a triumphant set… what I’m not prepared for, however, is dancing. As the crowd surrounding me begins to cut some serious rug to the band’s grandly dramatic racket, I’m overcome with visions of being shoved from my vantage point by stray elbows. ‘My poor feet,’ I begin to think, before realising that the gig is nearly over and I’ve still not detected what I had imagined to be inevitable agony. Pretty certain I should be gritting my teeth by this point, and ruing the day I agreed to this venture. But no, I’ve had a lovely time and my heels are distinctly unblistered; my toes remarkably uncramped. What gives? Still, if there’s one way to trial this newfound endurance, it’s by watching 40 minutes of ambient techno. At half eight in the evening. On a warm Sunday. In the end, Ben Chatwin’s set is a thing of sheer beauty (Tim Hecker-ish soundscapes merging into his own dystopian vision), but as ever when watching a man pushing buttons, I find myself nervously fidgeting and rocking back and forth on my heels. The razorwire tension of headliners Suuns is no better for those nerves but gets toes-a-tapping; as ever they exist in frequently altering locations on the venn diagram of rock and electronica, equally fluent in each language and forever merging the two to different extremes. Ordinarily at this stage of a gig, I’d be saying it’s kept my drifting attention away from my throbbing feet, but nope, everything’s still A-ok in that department. Hmm, aren’t I supposed to be breaking these in? When? How? NOTHING HURTS. By the final day of this experiment, I’m already coming to the conclusion that this is just the way things are going to stay. My feet are perfectly comfortable, no matter how far I walk, and I’m beginning to banish all thought of other footwear to the dustbin of memory. A nice soothing evening watching reformed California indie vets Grandaddy should be enough to cap what’s been a remarkably soothing few days for our feet… but wait! For the first time this week, I find myself in the midst of a full-to-capacity crowd determined to pogo itself into oblivion, and in these situations it’s either join in or retreat dejectedly to the back of the room. Panic sets in. This, surely, will be the moment to tip things over the edge… But nope, guess again. I’m actually all the more bouncy thanks to that thick rubber sole, and as the hard Summerhall floor becomes one giant trampoline, while a euphoric blast through the band’s enduring classic Summer Here Kids rings out, I’m as comfy as I’ve been all week. I walk home at the end of the night, my feet still far less heavy than my now-drooping eyelids, and ponder that this three-day experiment has taught me a valuable lesson in shoes. Sleek, classic and endlessly comfortable: my feet have a new pair of best friends.